Today’s story about Jesus healing a blind man describes an event, but it is also a parable. The blind man regained his sight in two stages. Jesus first spat on his hand and rubbed saliva in the man’s eyes. He saw, but not clearly. 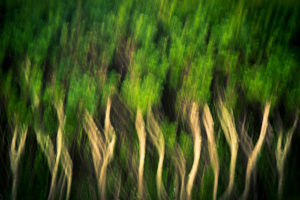 In that wonderful phrase, the man said that he could see people but they were like trees walking. Then Jesus laid hands on him a second time and his sight was restored completely. The parabolic explanation is that few people come to faith in a sudden conversion experience. Most of us come to faith gradually. It is more like the gradual dawning of morning than a sudden flash of light. Or, it is the drip of water eroding a stone rather than smashing the stone with a hammer. Why must we always look for a sign? Today’s Gospel begins, “The Pharisees came and began to argue with Jesus, asking him for a sign from heaven, to test him. And he sighed deeply in his spirit and said, ‘Why does this generation ask for a sign?’” It was a good question. 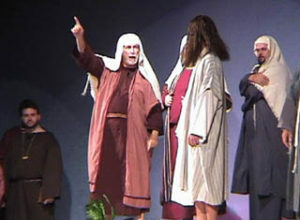 The Pharisees had criticized Jesus ever since he started his ministry. They objected when his disciples plucked ears of grain on the Sabbath, and when Jesus healed on the Sabbath. They complained that his disciples did not wash their hands ritually before eating. I like Mark’s Gospel because his portrayal of Jesus seems so ‘real’ – a Jesus who got annoyed when people didn’t understand what he had been teaching them. Like the Pharisees, the disciples had been with Jesus since his ministry began. They had been present at feeding miracles. Yet here they were, in today’s reading, worrying that no-one had remembered to bring enough lunch. Jesus had to remind them, “Do you still not perceive or understand? Are your hearts hardened? Do you have eyes, and fail to see? Do you have ears, and fail to hear?” Do we? Ever since I have been in the parish, we have collected and blessed food for the food bank at St. Matthew’s House. 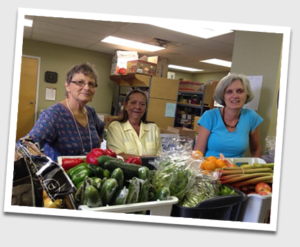 St. Mathew’s House serves people in one of the poorest areas of Hamilton. I think that we can give ourselves a little bit of self-congratulation. 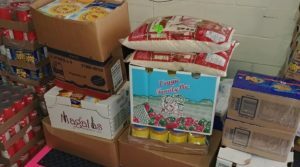 Our parish has been doing an outstanding job of collecting food. 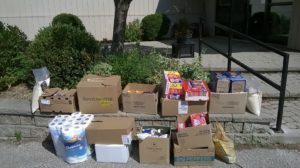 The last two donations to St. Matthew’s House from our tiny parish have generated nearly 900 lbs of food. That’s almost half a ton!! But we could do better. 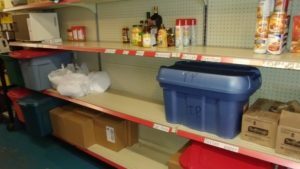 The shelves at St. Matthew’s House are often nearly empty. We want to kick our efforts up a notch by recruiting other people who might share our concerns. To use the phrase from today’s Gospel, our parish could progress from the parallel of seeing ‘like trees walking’ to seeing clearly. These helpers do not have to be present or future Sunday attendees. My dream is that if we can manage to publicize what we are doing already, other people will want to join the effort because it is worthwhile. You don’t have to stand for public office yourself to help in the upcoming municipal election campaign. It isn’t necessary to be a doctor to volunteer at your local hospital. 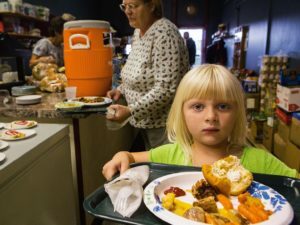 “You don’t have to live in the city to help fight urban hunger.” This isn’t a new project that will rely on other people to make it a success. We want to build on our outreach program that is already successful, to make it more so. St Matthew’s House helps us make the need more immediate, by letting us know their most urgent current needs. Too often, many of their shelves are empty. We then advertize their needs on our own social media. There are several approaches we can take and people we can target to help us. First and most obvious are the people, besides our congregation, who already come to use our building regularly. 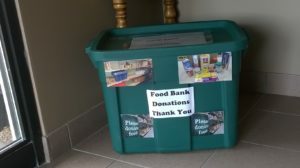 Those of us who live in apartment or condo buildings might be able to get permission to put collection boxes for food in their lobby or activities room. Some of us might be able to get collection boxes at our places of work. In all such cases the boxes would have to be emptied and the contents brought to St George’s each week to show that this is an ongoing commitment, not a one-time flash in the pan. Through social media and through neighbourhood flyers we can encourage donations literally at our door, during our ‘office hours’ 9 am to 3 pm Wednesdays and Thursdays. Today we celebrate the harvest. Every religion has always had a celebration to give thanks for the annual harvest of food. Even those of us who buy all our food from super-markets are aware that we depend on the bounty of nature to put food on our plates. We who have faith add the sense of divine goodness to the idea of ‘bounty of nature’ that our harvests represent. Most Canadians do not participate in the physical harvest personally. Instead, we use money to shop for food. Money is the harvest we earn through our labours. For those who are retired, it is the harvest of money we stored in our metaphorical barn while we were working. In essence, we barter our harvests of money for the foodstuffs in our grocery stores and supermarkets. In days gone by, farmers with a successful harvest might barter some of the grain crop for a hog. Today they probably “barter” the crop for money with which to buy other necessities. When you think about it, our money-based society is little different from the agricultural societies of 100 years ago, and even those that Jesus and his disciples knew. What if your harvest failed? Drought, flood, fire, disease, insect infestations – any of these calamities might leave your family with too little to get through the winter. That is the plight of the unemployed, the working poor, the refugee. Their harvest of money is often too little to get them to next week, let alone the next season. In the rural economy, the friends and neighbours of the farming family struck by disaster would normally pitch in and help. Food might ‘magically’ appear when a crop was lost; neighbours would join together in a barn-raising to replace a barn destroyed by fire. Again, that kind of assistance is no different from offering a helping hand with food to those whose harvest of money are inadequate to feed their families. Hunger hurts. But more than that, it leaves children unable to fulfil their potential in school. It leaves adults with too little energy to work productively or care for their children as they would like. Food is such a basic necessity that a wealthy society like Canada should be able to spare enough for everyone. St George’s has a proud tradition of helping in this way. It is our response to Jesus’ challenge, “Did you feed the hungry?” Because whether you did or didn’t, it is as if we had treated Jesus himself that way. 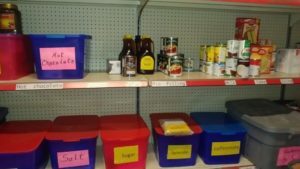 We want to kick our harvest of food donations up a notch by recruiting other people who might share similar concerns to help us expand our effort. 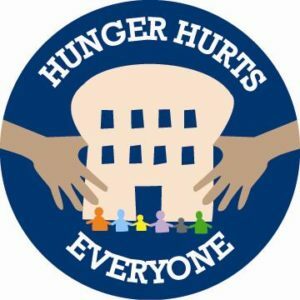 Remember, ‘You don’t have to live in the city to help fight urban hunger”! !